The Squire Winthrop was adopted by the Winthrop Business Guild (which later became the Chamber of Commerce) during Winthrop’s Bicentennial Celebration. Since then, the Squire has been used by a number of organizations to include the Winthrop Police Department, and other Town of Winthrop Departments. 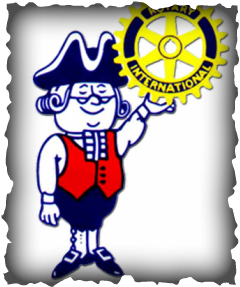 In 1992, during Joe Young's year as Rotary Club President he elicited the help of Rotarian, John Sapp, retired Colonel with the Army National Guard and artist, to design our club flag using the Squire Winthrop as a key part of our logo. Joe recently learned that the Squire was originally designed by someone who worked for a Bank (Unknown) in Winthrop. The Bank donated patches with the squire logo to the Winthrop Police Department sometime around 1971 and it was then the Winthrop Business Guild adopted the Squire Logo for Winthrop’s Bicentennial Celebration with the Bank’s permission.